Great day on the river- winter stones were sporadically coming off– made for fun nymphing!! The shop is open at 8:00 AM every Saturday and Sunday, before you suit up, stop in and pick up some local patterns that are sure to put a smile on your face. This entry was posted in fishing report on February 26, 2009 by Theaux Le Gardeur. 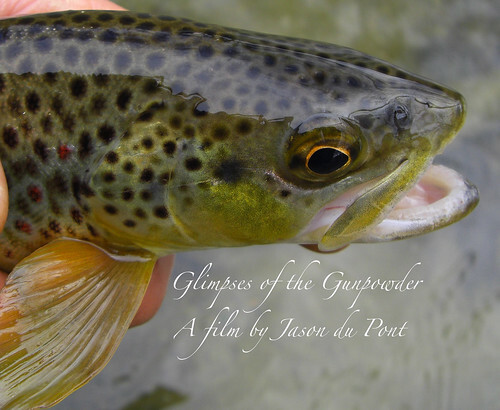 Glimpses of the Gunpowder is a fly fishing movie by Jason du Pont that spans a year of fly fishing along the Gunpowder river. It is an “up close” narrative describing hatches, the river and its wild fish framed with original music by Cantrip, a well-versed quartet of Scottish musicians playing “high energy,” traditional music. The DVD also features a film short focusing on Didymo in the Gunpowder River. I not only wanted to record all of the things that were unique to this river but also capture moments that seem to dissolve so quickly. 1.Stop in the shop and pick up a copy. 2.Give us a call at 410-357-9557. 4.Simply order the fly fishing film online with a Mastercard or Visa. This entry was posted in news, video on February 23, 2009 by Theaux Le Gardeur. 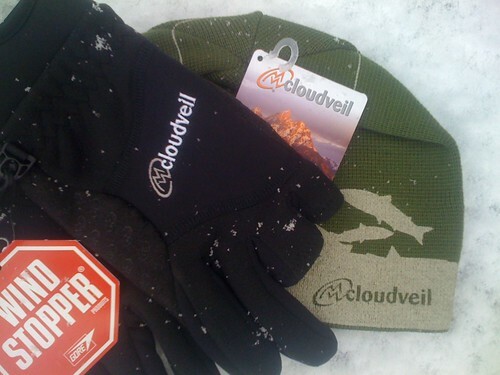 With more Winter weather in the forecast, We’ve just received a few items from Cloudveil, that, when applied in combination, get us one step closer to a cure for the Winter fly fishing blues. Considered essential Winter fly fishing gear, the Cloudveil Two Trigger glove at $35, exposes the first two fingers and thumb, is made of Windstopper fleece with wraptor construction and has a Scholler WB400 knuckle panel with a Clarino synthetic leather palm. The Banks Beanie at $32 is made of 100% merino wool and has a microfleece headband. Snow is optional and recommended on both items. Can’t live without them? Please give us a call at 410-357-9557 or drop us a line at info@backwaterangler.com to purchase. This entry was posted in news on February 19, 2009 by Theaux Le Gardeur. Just wanted to let you know that I had a great time this past Sunday.Thanks for fitting me into the class. Looking forward to sitting in on another class with Dave once my schedule opens up. We still have room in most of the fly tying classes on the event calendar. or drop us a line at info@backwaterangler.com to pre-register. The Gunpowder river is flowing at 68 Cfs and is clear. The sun is shining and river temps are 38 to 42 F throughout the catch and release section. Nymphing with small bead heads, and red butts is an effective way to cover water. 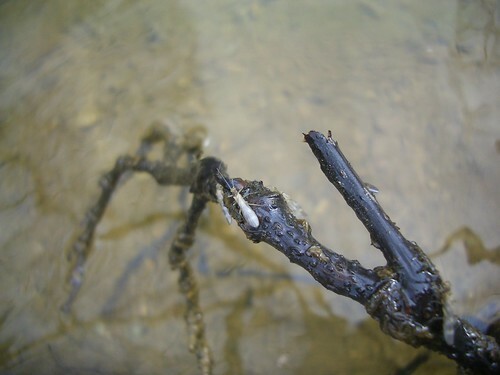 Most of the fish are holding in shallow riffles near logs and downed branches in the river-the stonefly nymphs crawl out onto these before pulling out of their shucks. So, if you don’t mind covering a lot of water, (not a bad way to stay warm) use the great trail network, a stream thermometer and keep moving until you find slightly warmer water near woody debris. Persistence can pay big dividends this time of year. Even during the Winter, larger fish still need to eat, and one must go fishing in order to catch fish. This entry was posted in fishing report on February 19, 2009 by Theaux Le Gardeur. Thanks for letting me use the Sharkskin fly line, it is awesome! 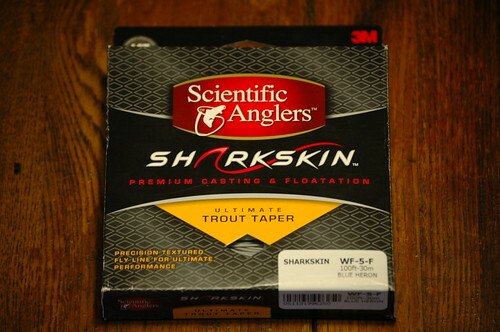 I have used it for nearly every kind of fishing in the area, small creeks, the Gunpowder, and on ponds. It has performed great for each one. It loads the rod quicker than the I ever thought was possible. Its light weight, and the dull gray color helps me on those cloudy days. I just wanted to thank you for letting me use this magnificent fly line. Thanks again! This entry was posted in reviews on February 18, 2009 by Theaux Le Gardeur. 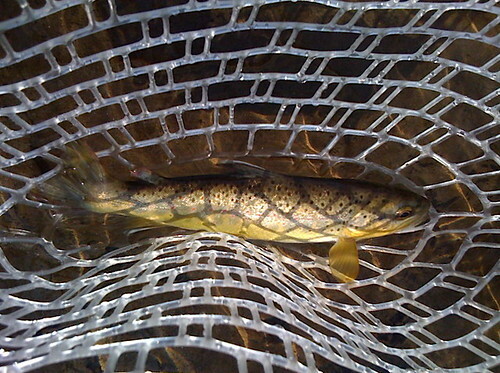 A perfect day was spent driving through Monkton on Sat., Feb. 7th – made all the better by making a stop at the fly shop. Thank you Jason for making our visit enjoyable plus showing us pictures of how the dwelling appeared years ago. My wife really enjoyed playing with the fly shop mascot – forgot to get his name. We left your shop and drove down Masemore Road to the Gunpowder – a few cars , but we didn’t see anyone fishing. I’ll contact the shop soon to check on the progress of the DVD Jason told us about. Thank you again for the nice day, see you soon. This entry was posted in news on February 18, 2009 by Theaux Le Gardeur. Please join us for a flyfishing school. 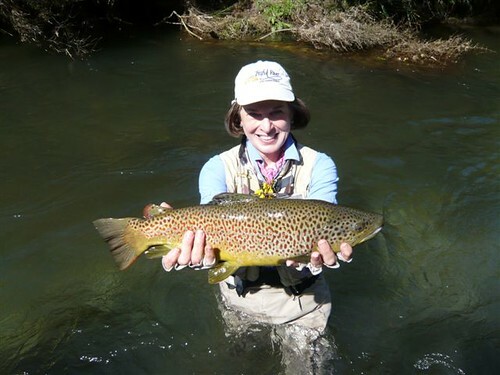 On Sunday, March 8, a Backwater Angler Guide will be teaching a fly fishing school that is ideal for beginners. If you’re planning on flyfishing Maryland, or anywhere else for that matter, this course is a great introduction to the sport. The school covers knots, casting, gear and fly selection. Schools are held in a meadow overlooking the Gunpowder river by a Maryland state licensed and insured fishing guide. Class is held from 11:00 AM till 2:00 PM. Cost is $100 per person and includes the use of gear. Class size is limited to 4 and pre-registration is required. Please give us a call at 410-357-9557 or drop us a line at info@backwaterangler.com to pre-register. This entry was posted in events on February 17, 2009 by Theaux Le Gardeur. Thanks to Fred and Pam Meier for the following fly fishing report from a Fall trip to New Zealand. We travelled to New Zealand in early November for two weeks of flyfishing, a week on the North island and a week on the South island. Although it had snowed in the week prior to our arrival, during our stay the weather was warm and sunny with only a day lost to rain and wind. On the North Island, we stayed at the Poronui Ranch and on the South Island, at Lake Rotoroa Lodge. The fishing experience in New Zealand is different from that in the Americas. As there are few natural predators, trout are generally found in open water rather than in riffles, under a cut bank or under hanging tree limbs. The water is exceptionally clear. Both the rainbows and the browns were large, between 4 and 6 lbs. ; and a net is needed for landing these wild fish.There are smaller fish, but our program was “fewer and better”.There was very little blind casting- the game in New Zealand is sight fishing. Where we were fishing, there was usually several hundred yards between the sighting of fish. Including entering and exiting the rivers through bush (dense vegetation and forest ), we were walking all day. Unlike Patagonia where there is an hour to an hour and a half for a leisurely stream side lunch, we would eat a sandwich in about 15 minutes and continue following our guide upstream. Because it was early in the Season, we fished nymphs most of the time. With a six weight rod, we were throwing a double rig of a size 12 green caddis nymph trailed by a size 18 pheasant tail. The leaders were long- 18 feet ending with 3X and occasionally 4X tippet. Casting accuracy was essential. Throwing a long line was necessary only a few times. We usually had at most three attempts to put an upstream cast in the slot, i.e., 3 to 4 feet directly in front of the fish. Spooking a fish is not uncommon. The fish we caught were large, fat and strong. Once hooked, they do RUN. 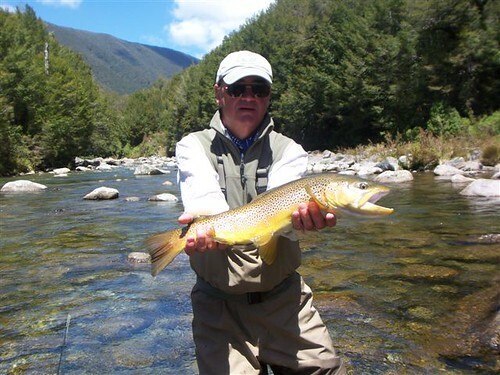 Although the North Island is known for its rainbows, we were fortunate to catch a lot of browns on the North Island. In particular, on the Taharua River which looks like a spring creek and is a tributary of the Mahaka river, we were catching large browns which the guide referred to as Scottish browns. We thought they looked like tiger trout. Finally, we did several days of heli-fishing. 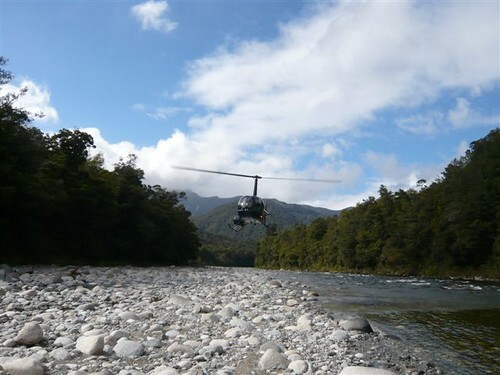 A helicopter would pick us up at the lodge and after a 35 to 50 minute flight over spectacular mountain scenery would place us in river which was otherwise accessible only by three to four days of hiking through rough wooded terrain. Because we were early in the Season, the fish were seeing a fly for the first time in six months. We had expected New Zealand to be simply a more technical version of Patagonia where we have fished for 15 years. But New Zealand was very different and very wonderful-its fish gods left us both humbled for lack of skills and elated when we fortunate to hook and land one of the beauties. We hope to return. This entry was posted in news on February 13, 2009 by Theaux Le Gardeur. Winter weather has shifted to warm air temperatures, but the melting of snow and ice are keeping water temps down. Spillover from Prettyboy, which has ice on its surface, has water temps as much as 6-8 degrees below the normal low-mid 40’s of February. A rough mix of half bottom release, and half icy spillover from Prettyboy has reversed the normal “warmer release closer to the dam” theory. Here are a few things we thought we would share about some differences this year in regards to water temps from previous years. The Gunpowder has hovered around 37-40 degrees F midday for the past few weeks, and the recent warm days did have an effect on water temps and hatches, just not in the upper miles of river. On Wednesday in 62 degree weather the water below the dam was 40.5 degrees at 2 pm, and just a few hatching midges. At 3 pm four miles down river the temps hit 45 degrees, which was two degrees warmer than the previous day, at the same place and time. Four miles of exposure to the sun meant a difference of 4.5 degrees and accounted for a lot of midges and a few sized 16 stoneflies. The fish were holding tight and not willing to strike my skating stonefly pattern, so it wasn’t quite warm enough. Last year I recorded similar water/air temps and the first stonefly appearance around January 29th in the Falls Rd area. Falls Road has the coldest water temps this year, so consider dipping a thermometer, and checking a few areas before suiting up. 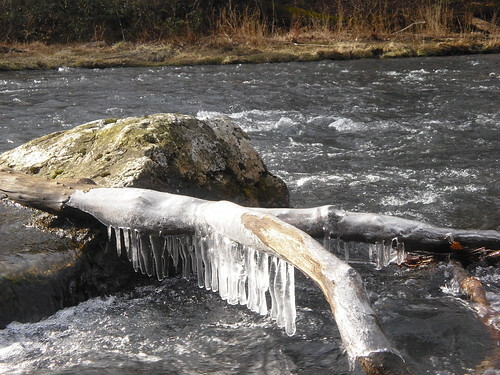 Numerous anglers reported seeing a few stones flying around or crawling on the bank in air temps in the upper 40’s. Nymph fishing, while tough has yielded at least a bite or two. A few anglers have reported catching half a dozen on recent outings with dark nymph patterns. This entry was posted in fishing report on February 13, 2009 by Jason du Pont.